In most of my previous texts on birds of Banderas Bay I tended toward introducing species, which are resident to the area, or even endemic – found nowhere else, but on Mexican Pacific Coast. Although this impressive long-legged, heron-like bird is reported in our area in summer, fall and winter months (Cupul Magaña, 2000), most of my personal records are from winter – precisely months of January and February. Apparently a resident to the Mexican Pacific Coast, this species breeds in Mexico only locally (Howell & Webb, 1995).Overall distribution range of the species is huge – Wood Storks can be found from Southern USA to Northern Argentina. Being a highly colonial species, a Wood Stork is rarely found alone. Most frequently, one can enjoy observing a number of these birds either foraging or perching in a tight group. Even completely inexperienced birder will not find it difficult to identify a stork. Its overall body color is white, only flight feathers, tail, head and legs are black. Striking heavy head and thick bill distinguish storks from any heron or other long-legged wading bird in the region. Storks with their 1.5m wingspan also belong to the largest birds around here. Should you spot a high-flying formation of large, predominantly white birds with outstretched long necks, you are looking at storks. You will have a better chance of finding them by visiting some of the coastal wetlands in the bay area though. Early morning is possibly the best time. If you approach unseen, you might be rewarded by a sight of a group of storks stalking in shallow water with their bills continuously submerged systematically searching for prey. Storks feed mostly on fish, amphibians and reptiles, but invertebrates are also consumed. Nest built of twigs and sticks is constructed by both parents. Both parents also cooperate in incubation of (usually) 3 eggs. After approximately one month semi-altricial* young birds hatch and are cared for by the parents for another 2 months. Wood Storks are protected by Mexican Law (NOM-059-ECOL- 2001) but their populations have suffered considerably due to habitat destruction. 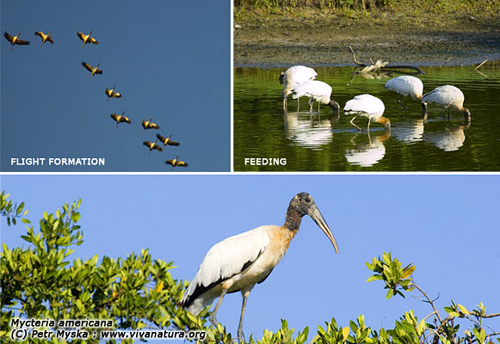 Coastal lagoons and mangrove swamps in our area –favorite feeding grounds to storks – are of paramount importance not only to them, but to dozens upon dozens of other fauna species. * SEMI-ALTRICAL: The young have a very limited mobility immobile, but their bodies are covered by down-like feathers (they do not hatch naked).